Experts say you can pass on these overhyped superfoods and get the same nutrients from cheaper, easier-to-find foods. 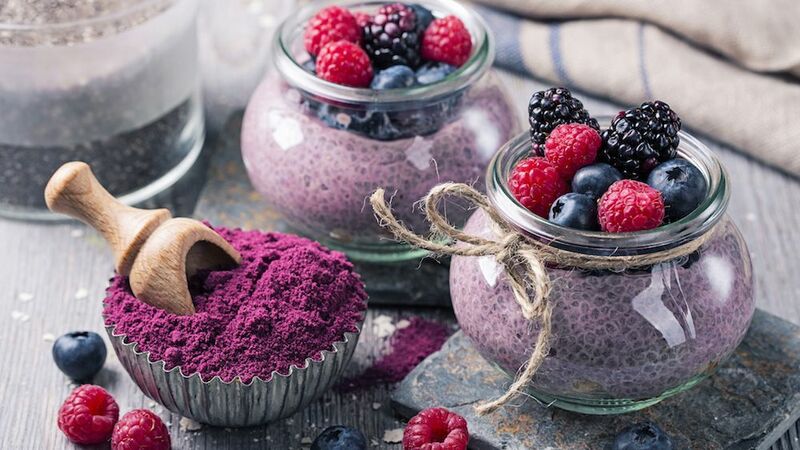 Superfoods, once a niche nutrition trend, have become so mainstream that even those who aren't interested in health and wellness know what they are. And that's definitely not a bad thing. "In general, I like the superfoods trend," says Liz Weinandy, R.D., a registered dietitian in the Department of Nutrition and Dietetics at The Ohio State University Wexner Medical Center. "It really puts the spotlight on healthy foods that contain multiple nutrients known to be important for optimal human health." Yup, that sounds quite positive to us. But there is a downside to the superfood trend, according to health professionals. "It is absolutely essential that people remember eating one or two superfoods will not make us super healthy," Weinandy says. Wait, so you mean we can't eat pizza all the time and then top it off with a superfood-filled smoothie?! Bummer. "We need to eat a variety of healthy foods on a regular basis for super health," she explains. What's more, trendy superfoods that come from exotic locations or that are lab-manufactured can be pricey. "Superfoods are often more expensive because they are highly processed into a powder or pill form and travel from around the world to get to your plate," notes Amanda Barnes, R.D.N., a registered dietitian. And sometimes, you can find the same substances that make those superfoods so beneficial at a much lower price—in foods you commonly see in the grocery store. Plus, there's the fact that the marketing around superfoods can be somewhat misleading. "While I don't diss superfoods in general because they may be dense in healthful nutrients, these foods may not be right for everyone because nutrition is not 'one size fits all,'" points out Arti Lakhani, M.D., and integrative oncologist with AMITA Health Adventist Medical Center Hinsdale. "Superfoods may only deliver on their promises if consumed in the right quantity, prepared properly, and eaten at the right time. Unfortunately, we don't know exactly how well nutrients from these foods are absorbed. Everyone is unique in the way they process the foods that they eat." "Activated charcoal is one of the latest health beverage trends, and you'll probably find it at your local boutique juice bar," notes Katrina Trisko, R.D., a registered dietitian based in NYC. (Chrissy Teigen is known to be a fan of activated charcoal cleanses.) "Due to its highly absorbent qualities, charcoal is typically used to manage overdoses or accidental consumption of poisonous chemicals. However, there is no research behind its ability to 'detoxify' our system on a daily basis," Trisko says. We're born with built-in detoxifiers: our liver and kidneys! "So instead of spending the extra money for this trendy beverage, focus on eating more whole, plant-based meals to support a healthy immune and digestive tract for long-term health benefits," she suggests. "Cultivated throughout history, pomegranates have more recently become popular due to marketing from companies like POM Wonderful," says Dr. Lakhani. There's some evidence to suggest that pomegranate juice and extract can reduce oxidative stress and free radical formation, which makes it anti-inflammatory and potentially anti-carcinogenic. "However, the fact is this is all in lab and preliminary animal studies. There is no data in humans, and as you can imagine, many things that work on lab animals don't have the same effect in human beings," Dr. Lakhani points out. While pomegranates are definitely good for you in general, fruit juice is high in sugar, which is pro-inflammatory, according to Dr. Lakhani. You can also get the same antioxidant benefits from foods like blueberries, raspberries, and red grapes. "Red cabbage and eggplants also contain anthocyanins and are foods that have a lower glycemic index," she adds. "Reported to be healing to the GI tract and a leaky gut, bone broth is made by roasting and simmering animal bones and herbs and other vegetables for 24 to 48 hours," Weinandy says. "Bone broth is similar to regular broth, but the bones are cracked and the minerals and collagen inside become part of the bone broth mixture." So far so good. "The issue comes when other things stored inside the bones come out with the nutrients, most notably, lead." While not all bone broth may contain lead, Weinandy feels it's better to be safe than sorry. "For this reason, I do not recommend people drink bone broth regularly. Use regular broth, which is a lot cheaper, and eat an overall healthy diet." These include reishi, cordyceps, and chaga, and they are said to help regulate your adrenal system. "These three varieties of mushroom powders are marketed as immune boosting and anti-inflammatory supplements," says Trisko. "Going for anywhere between $25 and $50, these supplements also carry a pretty hefty price tag. Adaptogens have traditionally been used in Chinese medicine and Ayurvedic practices, but there is not much solid research on their health effects in humans." Instead, she recommends stocking your fridge with a variety of colorful, fresh, fruits and vegetables for the week and by cooking with anti-inflammatory spices such as turmeric, garlic, and ginger. You've probably seen these in the grocery store and thought, "Why not add this to my smoothies?" But more often than not, these powders have very little health benefit. "Of all superfood trends, this is the one that gets my dietitian heart all riled up," says Mason. "Many green powders may not be inherently bad, but the trouble is that a fruit and veggie powder is more like a multivitamin made from produce extract than it is like the actual fruit or veggie. Sure, they can claim that they added 50 different kinds of produce to the powder. But it's just not the same as eating that whole vegetable or whole fruit," she explains. Why is that? "You're losing the fiber and a lot of the fresh and natural properties of the produce. Typically, our bodies process, absorb, and utilize the whole food vitamins and minerals more efficiently than artificial and supplemental ones," says Mason. Bottom line? "Green powders are not a replacement for actual fruits and vegetables. At most, they can be a little boost. If you have a limited budget, don't spend it on a powder. Research backs whole foods." You've probably heard about putting butter, coconut oil, and even medium-chain-triglycerides (MCT) oil in your coffee for an added boost. This trend is also known as bulletproof coffee, and it's advertised to provide "clean energy" and boost cognitive function, Trisko says. "However, there is little research to prove that this type of fat has any long-term health benefits. At the end of the day, you are just as well off drinking a regular cup of coffee with a balanced breakfast of lean proteins and healthy fats, like a slice of whole-grain toast with avocado and an egg fried in olive oil," she explains. "Opting for a balanced meal with healthy fats and proteins will keep your stomach and mind satisfied to get you through your morning."